York, SC (August 17, 2016) — Vision Metering has partnered with Hannah Solar on an 813 kilowatt solar installation for their facility in York, South Carolina. The project is part of Vision Metering’s first steps toward a more sustainable future. Vision Metering’s decision to go solar came from the company’s passion for sustainability. “We are thrilled to continue our environmentally friendly approach in business by reducing our carbon footprint by 50%,” said Randy Austin, owner of Vision Metering. The system, which is through Duke Energy’s Solar Rebate Program, will offset 254 tons of waste annually—the equivalent of planting 18,905 trees—and can supply the energy needs of 108 homes. Construction is set to begin in late September. Vision Metering, LLC, formerly known as Austin International, began as a broker of surplus equipment within the utility market over two decades ago. Since its re-branding in 2011, Vision has continued to excel in the niche market of refurbished material sales while also developing a fast-growing and highly reputable line of meters and metering accessories. Remaining true to its roots, Vision provides products that are constantly evolving to meet the needs of its customers while maintaining an affordable and fair cost. Vision currently partners with communications companies across the country to provide its customers state-of-the-art, reliable AMI metering systems. These partners include key players in the industry, such as Nexgrid, Verizon and Sigfox. By aligning itself with reputable communications companies and providing a quality product, Vision continues to surpass expectations by remaining at the forefront of technology and progress in an ever-growing and evolving industry. 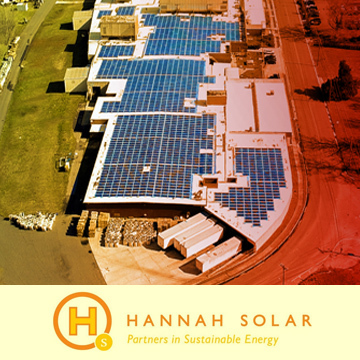 Headquartered in Atlanta, Georgia, Hannah Solar is a full service, NABCEP certified solar integrator dedicated to providing the Southeast with the very best in engineering, products, installation and service of solar arrays, electric vehicle (EV) charging stations, energy storage systems and Generac® critical backup generators. Our team is comprised of licensed master electricians in AL, GA, MS, NC, SC and TN, service technicians, project management professionals, business development managers, designers and installers—working together to serve our clients as a reliable and experienced resource in sustainable energy integration.